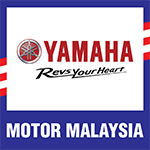 PAHANG, 17th January 2016 – Hong Leong Yamaha Motor Sdn. Bhd. 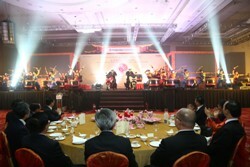 (HLYM) welcomed the year of the fire monkey through a celebration with the dealers in their annual Chinese New Year Dealers’ Appreciation Dinner. 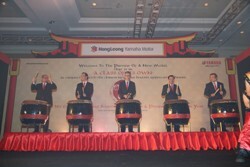 This year’s surprise ‘Ang Pow’ from Dato’ Jim Khor, the Managing Director of HLYM, was the introduction of the new global scooter model Yamaha “NMAX”. Yamaha NMAX is a sporty scooter model based on the concept of “City Commuter with Global Prestige”. The NMAX has a newly developed BLUECORE engine, which boasts improvements in combustion efficiency, improved cooling performance and reduction of power losses. As a result of this trinity of improvement, the NMAX is able to achieve a “higher maximum power output and operating torque”, said Mr. Takehiko Gotanda, Engine Project Chief of Yamaha Motor Company, Japan. 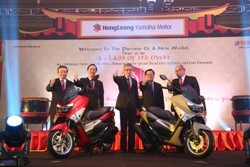 A new liquid-cooled, 4-stroke, SOHC, 4-valve, 155cc fuel-injected engine with CVT on a body with styling that reflects the “MAX” family of models like the “TMAX” and “X-MAX”, which is popular in Europe. 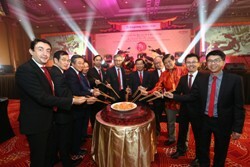 The NMAX has been planned and developed as a world-class next-generation 155cc scooter that offers strong torque at low speeds and power at high speeds, which makes it an ideal scooter for the Malaysian motor scooterists that traverse through urban city centers and highways. Yamaha NMAX inherits the DNA of the MAX series, and offers sporty performance, a compact body size for ease of use and a high level of convenience in urban areas, plus styling and functions that denote its status as a next-generation model that will fulfil the needs of customers wanting to step up from 100cc–125cc scooter models. 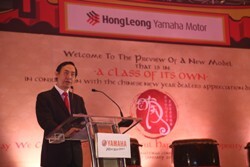 “I am very certain that this new NMAX model will earn you bountiful prosperity in the year of the fire monkey The bike will definitely give customers a new fun-filled riding sensation coupled with a prestigious image synonymous to the Yamaha brand “, said Dato’ Jim Khor during the closing of his speech to indicate his confidence in the success of the model. · New liquid-cooled, Single Overhead Camshaft (SOHC), 4-valves, 155cc BLUECORE engine with Variable Valve Actuation (VVA) and Continuous Variable Transmission (CVT). · LED headlights and rear brake lights for brighter and clearer illumination during riding. · Seat equipped with spring fitted hinges that offers more convenience during storage compartment accessibility. 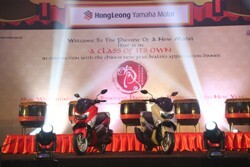 The NMAX comes in two trendy colors, red and gray, and will be made available to all authorised Yamaha dealers nationwide by April of 2016.